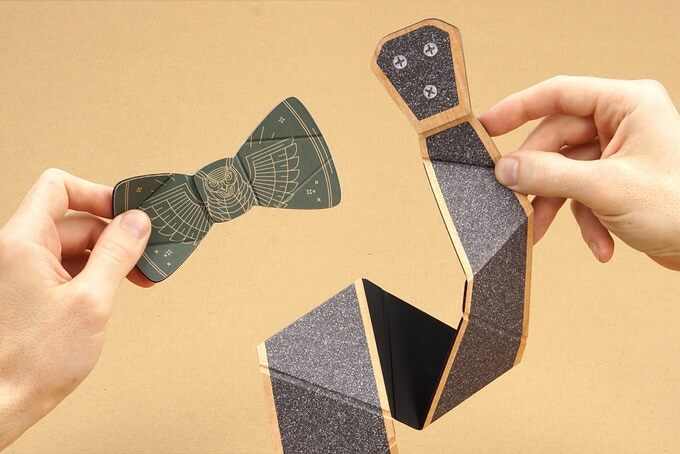 While cardboard neckwear may sound like a prop for a high-school play, at Cardboard Carl, the team has added sophistication to the concept, creating ties and bow-ties that you can actually wear outside the house. 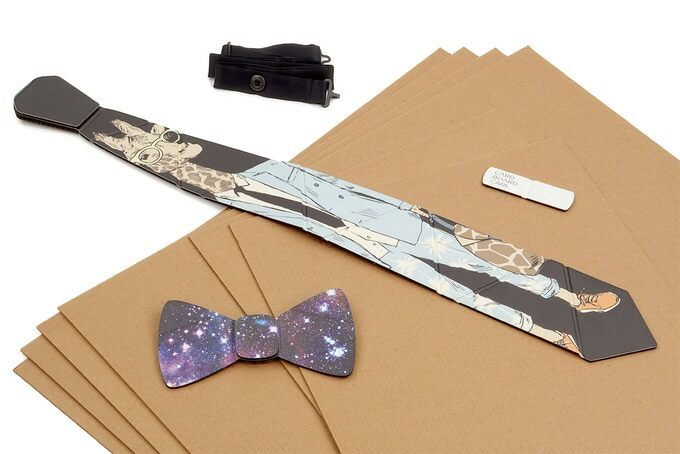 This collection of cardboard neckwear is quirky yet wearable and is supposed to be extremely durable too. Here is all you need to know about this unique Kickstarter campaign. 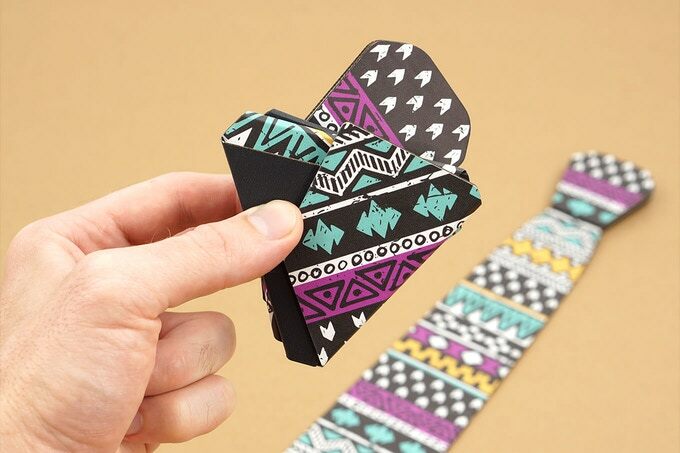 Each piece of the cardboard neckwear is more durable than standard cardboard due to the high-frequency corrugation incorporated in the design. These ties and bow ties are flexible and bendable, mimicking the behavior of fabric ties, and they can even be folded to fit inside your pocket. Although it may seem that carboard neckwear will be bulky and uncomfortable, these ties are in fact quite comfortable to wear on a daily basis. 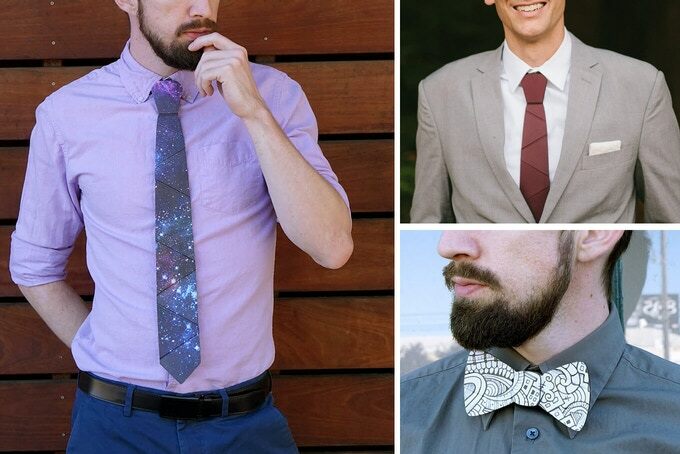 Each tie comes with an adjustable neck strap that needs to be worn around the collar. The tie can then be attached to this strap. This provides the ease to snap-on and snap-off your tie whenever you want and makes sure that one size fits all. Additionally, this cardboard neckwear will save your time each morning as you won’t have to perfect that Windsor knot before heading out to work. The makers have also kept the practicality of wearing this cardboard neckwear in mind while designing the prototypes. Each tie comes with an embedded metal washer and a magnetic tie clip that you can use to keep the tie in place as you go about your day. From GQ to Men’s Health, every authoritative website on men’s fashion agrees that a tie can boost your personality and can make you the perfectly-dressed man. Also, it is the season to experiment with bold patterns and styles, so why not take the experimentation to a whole new level with some statement carboard neckwear? This extraordinary cardboard neckwear comes in a variety of colors and designs and the material is water resistant and smudge proof, which makes this an even better investment. From the classic reds and blacks to the bold tribal and giraffe prints, there is a tie for every mood, occasion, and personality. If you want to make heads turn wherever you go then this cardboard neckwear is the right choice for you. The creators had the vision to add an element of fun to ties, which are usually associated with a formal setting, and they have successfully managed to achieve this goal with their colorful and innovative cardboard neckwear collection. The Kickstarter campaign for this fascinating cardboard neckwear is currently open. Pledge today to be among the first ones to sport this bold fashion statement. No one will ever accuse you of having a boring wardrobe once you add some cardboard neckwear to your collection, so act now to show your quirky side to the world.